It's got a 5.4 on IMDB, if that tells you anything. CHIPS means well, and Dax Shepard always surprises me with his sincerity. He seems like a really nice guy. But it's rated R for the reasons most comedic movies are rated R: toilet humor, toplessness and, in this particular case, a few severed limbs and one decapitation. The movie had potential. At a minimum, it could have been wonderfully nostalgic and boasted a killer soundtrack. Gosh, a killer soundtrack. Instead, it's just flat and largely unfunny. Uncomfortably unfunny. Groaningly unfunny. Larry Wilcox is a no-show, but Erik Estrada makes a cameo. Disappointingly, that's not funny either. In the back of my mind, I had imagined Robert Pine might appear out of the blue (as Sgt. 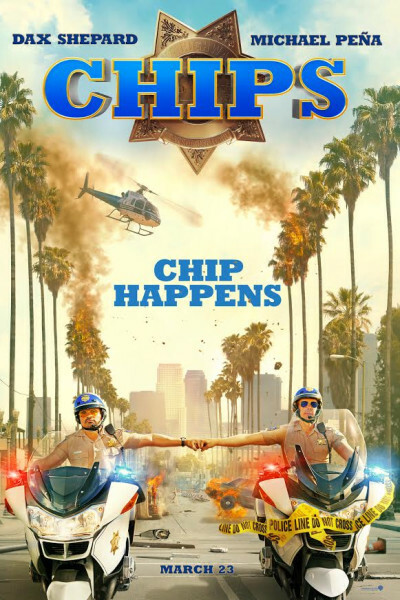 Joseph Getraer), Chris Pine alongside him as an Easter Egg of sorts, but alas, CHIPS is no Trojan Horse, so there's nothing so clever. It's a straightforward TV show, for 01:40:00, and feels like it. Hammy acting, goofy bang-bang gunfights, and heavy-handed motorcycle stunts choreographed to feature Dax's real-life biking prowess. He is really great, and there are some awesome Ducatis. But Vincent D'Onofrio, Ed Begley Jr., Adam Brody, Jane Kaczmarek, Maya Rudolph, Josh Duhamel, Kristen Bell (doing her best Bo Derek), the ever-sleazy Ryan Hansen, and all the rest appear to be going through the motions, as if having accidentally walked on-set en route to their mailbox, bathrobes on and coffee in hand. Making it all very "meh." And oh, my wife reminds me, "Be sure and tell them, 'NOT KID FRIENDLY.'" Yep. Roger that. That's a big 10-4 good buddy.